Hello! 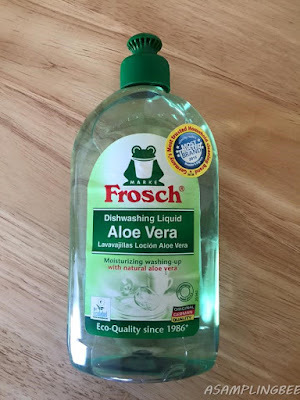 Today, I share with you the best cleaners I have ever used. Frosch USA sent me their Cleaner Starter Pack to review. The Starter Pack includes a Lavender Universal Cleaner, Baking Soda All-Purpose Cleaner, Aloe Vera Dishwashing Liquid, Lemon Toilet Bowl Cleaner, Bio Spirit Glass Cleaner and a Lemon Shower and Bathroom Cleaner. Although the Starter Kit includes the Lemon Shower and Bathroom Cleaner, I did not receive it to review. Frosch USA was started in Germany in 1986 by Werner & Mertz. They started the company with the intention of offering environmentally friendly cleaning products that were able to compete with traditional cleaning brands without compromise. Environmental considerations permeate every aspect of Frosch - production, ingredients and packaging. 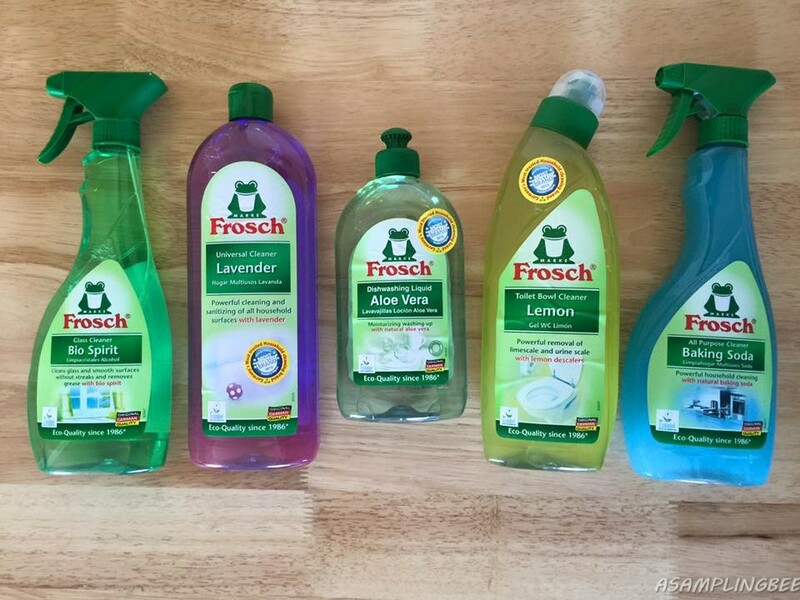 Frosch USA's Products have not been available in the U.S., until now! The Lemon Toilet Bowl Cleaner removes dirt, limescale and urinescale. The results? 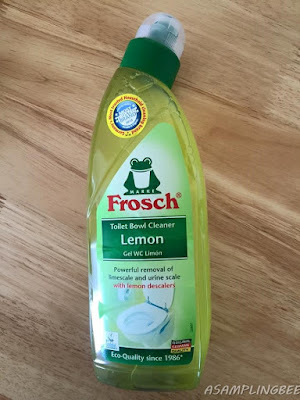 A lemony fresh and naturally sanitized toilet! This Vegan formula removes stubborn stains quickly. This natural toilet cleaner is safe for septic systems. It is EU Ecolabel certified. Ingredients include- < 5 % anionic surfactants, perfumes. Further ingredients: citric acid, biodegradable thickener, cosmetic grade colorants. 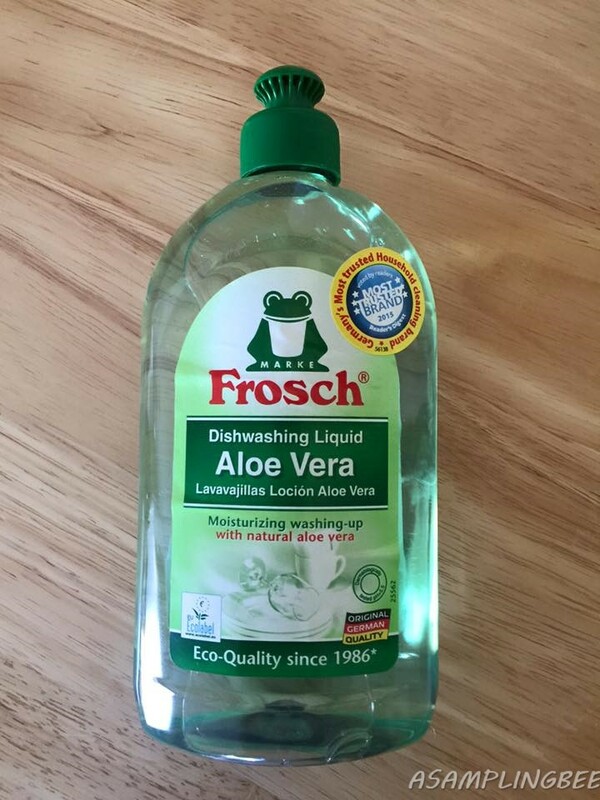 Frosch's Aloe Vera Dishwashing Liquid is gentle on your hands and tough on your dishes. Your hands will be soft and your dishes will be sparkling clean! This Vegan formula quickly dissolves grease and dirt while moisturizing your hands. It's aloe scent is lovely! Ingredients include- 5-15 % anionic surfactants, < 5 % non-ionic surfactants, amphoteric surfactants, Preservative (Lactic Acid), perfumes. Further ingredients: aloe vera barbadensis, food grade colorants. Bio Spirit is an all- natural Glass cleaner that takes care of those stubborn streaks and fingerprints on your windows. This glass cleaner removes grease effortlessly. Although this is a glass cleaner, it can be used on multiple surfaces. 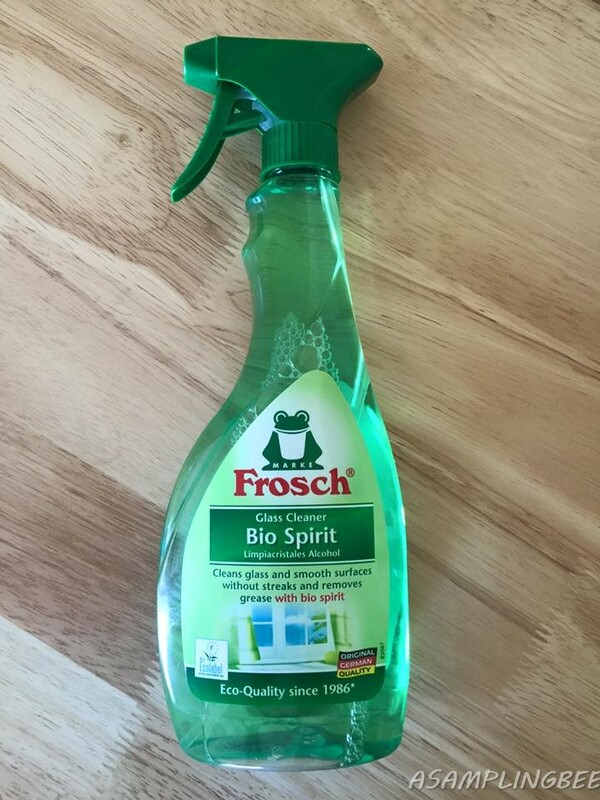 Bio Spirit all-natural glass cleaner is EU Ecolabel certified and Vegan. Ingredients include- < 5% anionic surfactants. Further ingredients: alcohol/spirit, water-soluble solvents, food grade colorants. With Frosch's Lavener Cleaner, clean your wooden floors, kitchen floor, bathroom floor and tile. You can use this universal cleaner on any surface. It's Vegan formula is gentle on your skin as well! This item is EU Ecolabel certified. 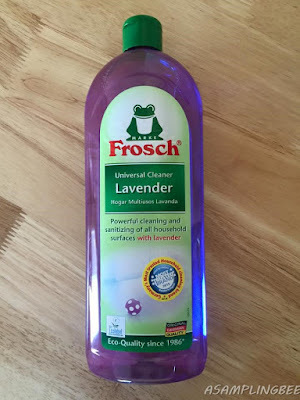 Your home will smell Lavender Fresh! Ingredients include- <5% anionic surfactants, non-ionic surfactants, soap; preservatives (phenoxyethanol), perfumes. Further ingredients: lavender extract, cosmetic grade colorant. 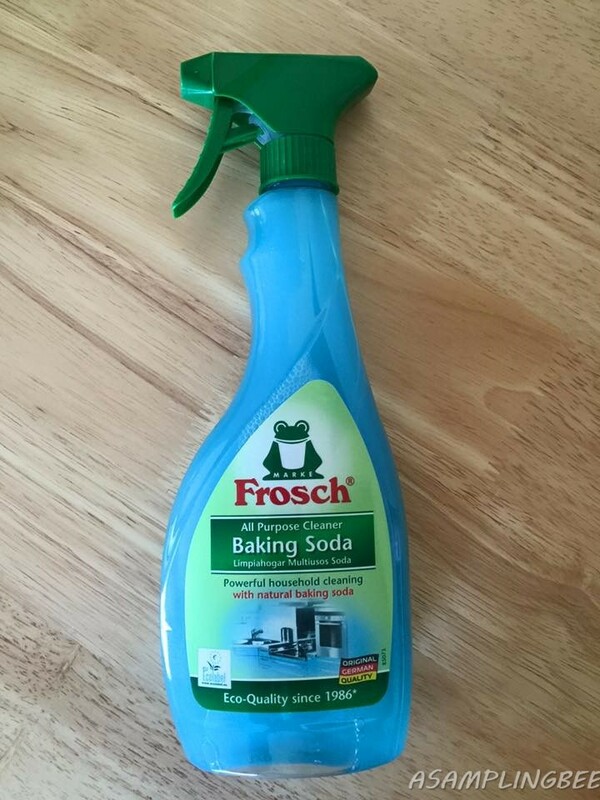 Frosch's All-Purpose Cleaner with Baking Soda removes stubborn grease and dirt. It leaves your surfaces sanitized and smelling wonderful. Can be used on most washable household surfaces. The Baking Soda All Purpose Cleaner is vegan and EU Ecolabel certified. Ingredients include- 5% anionic surfactants, Non-ionic surfactants, Soap, Preservatives (phenoxyethanol), Perfumes. Further ingredients: soda, food grade colorants. I am in love with these cleaners. I love an all natural cleaner but I don't like how most of them don't have a smell. When I clean, I like my house to smell clean after. With these cleaners, I achieve a clean smelling house while making sure that I use safe cleaners for my family. My 3 year old loves to help me clean. 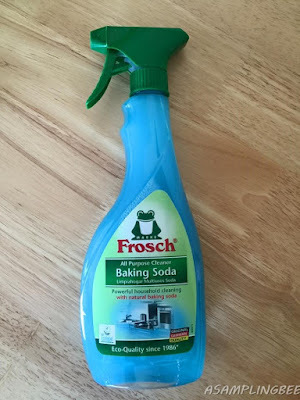 I know that Frosch's cleaners are safe for him to use. So, I feel good about him helping me. My favorite cleaners are the Baking Soda All Natural Cleaner and the Lemon Toilet Bowl Cleaner. don't get me wrong, I love all of these cleaners. But, these are on the top of my list. They smell awesome. I love the smell of the Baking Soda Cleaner. It's fresh and leaves my countertops sparkling clean. The Toilet Bowl Cleaner makes my bathroom smell clean and it takes care of stubborn urine odors. Each one of these product can also be purchased separately. They range in price from $4- $6. This Starter Kit costs $25 and includes 6 cleaners (I received only 5 to review). Enter to win the 5 cleaners that I reviewed here. Prize supplied by Frosch USA. Prize will be shipped by me :) Good luck! USA only! Sounds like you got a nice clean house! I need to clean mine this weekend. I will have to check into these products, natural ones in the past have not impressed me, but this one look promising. I am all for eco-friendly cleaners, they are really nice to use on furniture and for cleaning in general. I get you on the no smell part, I also love a clean smelling home. It looks like a good product to try and to use. What a perfect time to try out new environment friendly products. Earth Day always inspires me to give more consideration to my choices that might harm the planet. This product sounds awesome! I like the fact that it is environment friendly! Great products and fun giveaway! I'll have to check this brand out! Ooo these products sound pretty fantastic!!!! I will have to try them out! Good review. I like your blog. Thanks for sharing. It's great toilet bowl cleaning tips. It is very essential for how to clean toilet bowl very properly. Vinegar, coca-cola and orange is best source to clean toilet very fast.